The event organisers wish to thank all who contributed in any way to our biggest and best ever promotion of KERRY GROUP RÁS MUMHAN 2013. One hundred and ninety two riders took the start on Good Friday and one hundred and twenty five got to the finish on Easter Monday after five hundred and five kilometres in tough conditions. This could only have been achieved by the hard work and commitment of the hundreds of volunteers who helped out during the race. While some of us have more visibility than others the reality is that, the role fulfilled by each and every volunteer is critical to the success of the event. So to every flag-woman and flag-man , to every driver, Commissaires, motorcycle marshals, to everyone who helped at race starts and race finishes, to our technical officials and to everyone who helped in any way we say well done and be proud of what we all achieved together. Very special thanks are due to the Doyle family for the wonderful hospitality at the Prize Presentation. The Public deserve a special mention for their courtesy and patience with us when we were in the various areas of the beautiful South West of Ireland. The continuing success of our race is closely linked to our main sponsor Kerry Group. Our success is tied to the very high level of commitment they have given us and long may it continue. The contribution of our secondary sponsors is a further fundamental element of our success also and their input is a key part of keeping the event local. The central focus of the event is the riders and the teams. 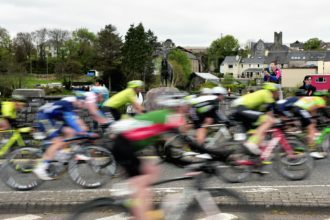 The conduct of the riders and the sporting way they conducted affairs over the weekend were substantial contributions to an astonishing race given the conditions the riders had to face particularly on Sunday in South Kerry. Their fitness, strength, speed and technical capacity was quite amazing to watch. Our friends in the media were superb and the coverage we got was vital to the public image of our race. We are very grateful to all our friends in Radio Kerry, national radio, RTE, TG4, the print media, various on line media, and especially our twit in the car, Fiona Cooke who Tweeted constantly and provided real time information to her thousands of followers worldwide . We thank you for your wonderful coverage of the event. The safety of the race is the most important consideration in the planning of KERRY GROUP RAS MUMHAN. The support from the Kerry County Council and Cork County Councils Roads Departments was immense. The area roads engineers and their staff are true heroes of cycling sport. Particular thanks have to go to the Area Engineers in Killorglin, Killarney, Kenmare, Castleisland, Tralee, and West Cork areas and their staff. Finally our Gold Medal Thanks has to go to the members of An Garda Siochana. From the early planning through to the finish the support of all the members in the Divisions of Kerry & West Cork was magnificent. The skill of the Garda motorcycle outriders with the race and the efficiency of the Garda Support at starts, finishes and difficult junctions was remarked on by everyone. 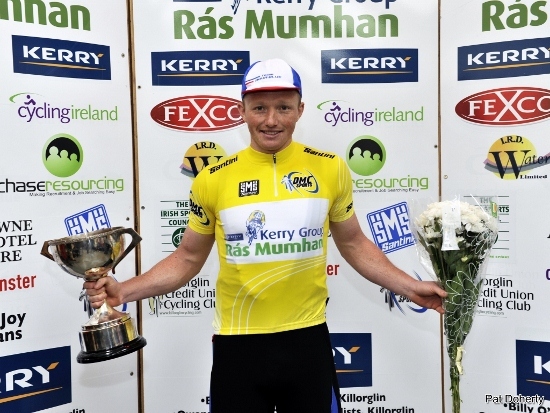 Planning for Kerry Group Rás Mumhan 2014 will get underway shortly and we hope to see you all again next year to share with us, the enjoyment of a spectacular week end.